Construction of Lakeview Square was split into two phases. The first, which began in September of 1972, included a 17-storey, 411-room Holiday Inn, a 25-storey, 264-suite apartment building (Holiday Tower North) and Three Lakeview Square, a six-storey 61,000 square foot office building. Phase II marked the construction of another six-storey office building (Two Lakeview Square), another 25-storey apartment building (Holiday Tower South), an underground parking complex and 35,000 square foot Japanese Garden. Construction was completed in 1974. The entirety of Lakeview Complex, designed to be a community within itself, offering “maximum opportunity to live, work, play and relax without the problems of traffic jams and rush hours,” are interconnected by a series of climate-controlled walkways, 16’ above grade and are similarly linked via an underground concourse. This skywalk system also extends to the Winnipeg Convention Centre, a key component in the aforementioned Downtown Development Plan. All buildings overlook a central Japanese Hayashi Garden courtyard with reflecting pools, stone lanterns, formal flower beds, and an authentic Japanese Tea House. Lakeview Properties Ltd. continued to develop both York Centre and Rupertsland Square, a joint undertaking with the Hudson’s Bay Company and The Cadillac Fairview Corporation Limited. "Con-Force 25 Years: A Tradition of Progressive Leadership -- Highlights of Con-Force Success," Western Construction and Industry, 26, 3 (May 1974), pp. 14-27. "Lakeview Acheives Full Diversification within its market," Western Construction and Industry, 25, 10 (November/December 1973), pp. 13-19. "Lakeview Development Inaugurates Winnipeg's Downtown Development Plan With Holiday Inn Start," Greater Winnipeg Industrial Topics, 31, 5 (october 1971), pp. 4-5. "Lakeview Square," Western Construction and Industry, 25, 10 (November/December 1973), pp. 4-8, 10-12. "Lakeview Square," Winnipeg Industrial Topics, 36, 6 (December 1976), pp. 4-5. 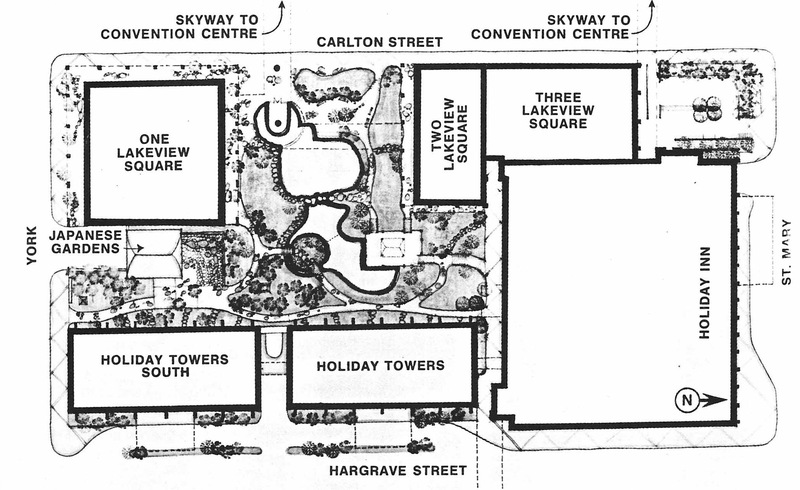 "Lakeview Square Reaches To The Top," Western Construction and Industry, 24, 9 (November/December 1972), p. 44. "Progress at Lakeview Square," Winnipeg Development News (June 1973), published in Winnipeg Industrial Topics, 33, 3 (june 1973). University of Manitoba Libraries, Dept. of Archives and Special Collections, Winnipeg Tribune, Subject Clipping Research Files, Microfilm Roll #32, file on "Construction 1963-1974." University of Manitoba Libraries, Dept. of Archives and Special Collections, Winnipeg Tribune, Subject Clipping Research Files, Microfilm Roll #76, file on "Lakeview Development Ltd. 1970-1980." University of Manitoba Libraries, Dept. of Archives and Special Collections, Winnipeg Tribune, Subject Clipping Research Files, Microfilm Roll #161, file on "Winnipeg Convention Centre 1968-1974"
University of Manitoba Libraries, Archives and Special Collections, Winnipeg Tribune Photograph Collection.